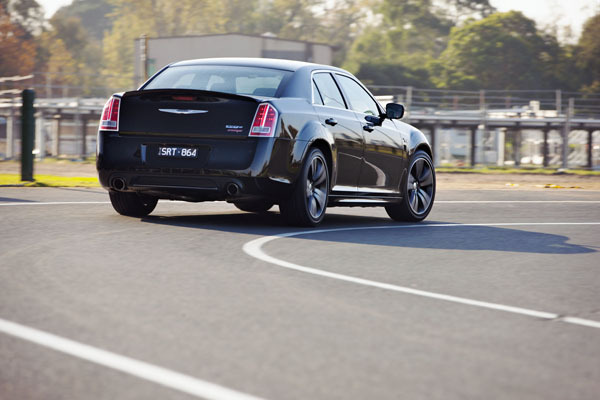 The reasoning behind the Chrysler 300 SRT Core is as simple as the car itself. The thinking behind it goes back to the core of buyer preferences – value for money in a high powered machine. A neat $10,000 has been stripped from the price of the standard 300 SRT, dropping it to an affordable $56,000. As it has kept the core values of the car exactly as before, the new model is tagged Chrysler 300 SRT Core. That $56,000 recommended price puts the big Chrysler right down with the hot Ford Falcons and Holden Commodores. Tellingly the SRT Core is under the price of the lowest-cost HSV models. This special 300 model has been developed specifically for the Australian market as the guys in the States are well aware of our enthusiasm downunder. Indeed, the Americans are now to be offered the Aussie-specced car on their home market. Price trimming of the Chrysler SRT Core has been achieved by giving it cloth trim instead of leather; there’s no heating of the rear seats, though the fronts still get warmed (but not cooled); the drink holders are no longer connected to the air conditioning system so remain at the ambient temperature; and there’s no floor mat or cargo net in the boot. 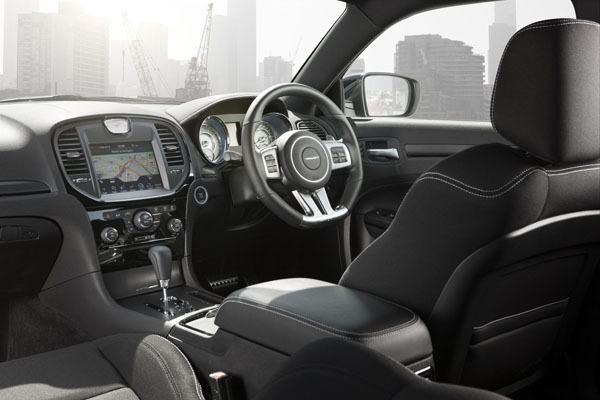 A basic audio system is used, with the number of speakers reduced from nineteen to six – meaning you will have to spend more time listening to the exhaust note of the big Chrysler V8. Sounds good to us! Standard, not adaptive, cruise control is used; you miss out on the adaptive suspension damping system; there isn’t a blind spot monitor (though surely anyone who drives an SRT knows how to set door mirrors?). The rear cross-path detection system is a handy feature but sadly it’s been stripped out. The Chrysler 300 SRT8 Core has 20-inch alloy wheels in a twin-five-spoke design. There are ‘Hemi 6.4L’ badges in red and chrome on the front guards and a red ‘Core’ badge on the bootlid. Core is offered in eight paint colours: Gloss Black, Ivory tri-coat pearl, Billet Silver metallic, Jazz Blue pearl, Granite crystal metallic pearl, Deep Cherry Red crystal pearl, Phantom Black tri-coat pearl, and Bright White. The Core’s cabin has black seat trim with white stitching and ‘SRT’ is embroidered into material. There are piano black bezels and matte carbon accents on the instrument panel and centre console. All the important powertrain parts remain as in the standard Chrysler SRT8. 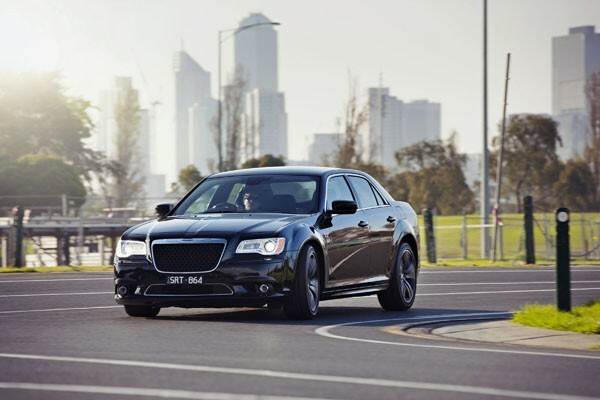 The 6.4-litre Hemi V8 engine produces 465 horsepower (347 kW in Australian terms) and a great 631 Nm of torque. The active exhaust system remains as does the excellent launch control system that really gets the big beast moving with just the right amount of wheelspin. Iit’s only to be used in the correct locations of course. This American muscle machine sounds great, though a little more volume would be appreciated at low to moderate throttle openings. It’s a bit sad when AMG Mercs and Bentley Continental Speeds provide bigger sounds than a Chrysler Hemi. A five-speed automatic transmission is used instead of the more modern eight-speed unit now on the rest of the 300 range. But if you’ve got 631 Newton metres of torque at your disposal you really don’t need that much more assistance from a bunch of extra ratios. Awesome stopping power is provided by the big Brembo disc brakes. Throttle response is all-but instantaneous and the automatic reacts quickly to the driver’s demands. Trundling up and down the M1 motorway between the Gold Coast and Brisbane at 115 km/h we saw fuel consumption average a hard-to-believe eight litres per hundred kilometres. That’s partly due to the COD (Cylinder On Demand) feature that cuts four cylinders under light load. That’s right, our Chrysler 300 SRT Core was a four-cylinder car! Consumption leapt in urban driving, being in the mid teens most of the time. In the country and having a go it was getting towards the twenties. Road grip is high, but this is a big heavy car so you don’t get the same cornering enjoyment as you do from the best of the small hot hatches. Ride comfort isn’t too bad, but rough roads certainly let you know the low-profile tyres aren’t able to cushion the car all that well. An excellent concept in affordable performance motoring, the big Chrysler 300 SRT8 Core is a permanent addition to the Chrysler 300 range. Incidentally, that range has just been expanded to include yet another model, the 300S. We cover in a separate story. Note: These prices do not include government or dealer delivery charges. Contact your local Chrysler dealer for driveaway prices.